Drivers of vehicles carrying dangerous goods in vehicles with a gross weight exceeding 3.5 tonnes for packages and for all road tankers must undergo training and obtain a vocational training certificate issued by DVLA Swansea. Vocational training certificates are obtained by passing the relevant exams of Core and either Tanker or Packages and at least one class of dangerous substance. Candidates must hold a UK or Northern Ireland driving licence in order that a certificate can be issued, this does not have to be a full driving licence. 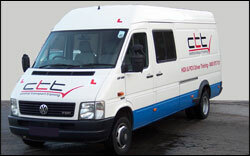 Courses which a driver attends, must be approved by the DETR, examinations are administered by City and Guilds London. Certificates are valid for 5 years and must be renewed by undertaking a refresher course during the 4th year. Regulation 3 of driver training regulations 1996, states that the operator of any motor vehicle must ensure that driver receives adequate instruction on the dangers and what to do in the event of an emergency. 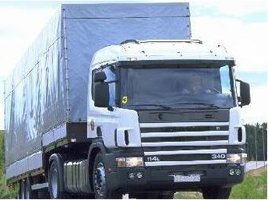 This regulation applies to those vehicles up to 3.5 tonnes gross weight and those drivers carrying below the limited quantities, but do not have to obtain a certificate issued by DVLA. Note: In addition to drivers being trained, it is also a mandatory requirement that anyone whose duty is involved with the carriage of dangerous goods must also be trained. The regulations are aimed at Consignors, Vehicle Operators and those who load and unload. CTT can provide details of these courses. Drivers do not need to have an HGV licence to obtain a certificate, although candidates must have a driving licence number. Courses are available either weekdays or weekends to facilitate operational needs. CTT also conducts these courses on a mobile basis. Since 1994 CTT Limited has been approved by the DETR and is a City and Guilds approved centre for the conduct of examinations. The company prides itself on giving candidates "driver to driver" training; this is from over 20 years operational experience in the carriage of dangerous goods. The UN system provides for nine Classes of dangerous goods relating to the principle hazards inherent in the goods (this system is used for all modal regulations). Class 9 Miscellaneous dangerous substance and articles. Note: Class 1 and 7 are specialised courses and as such are not part of our normal programs. We do however; to satisfy client needs provide these upon request identify training venues of our associates that would be covering these subjects. Tanks: Tank and Tank Containers, any goods carried in a road tanker or tank container. Limited Quantities: Certain dangerous goods may be carried without the need for the carriage of dangerous goods by road regulations to apply, however please be aware that HSE codes of practice place a duty on all employers to bring about the dangers to employees and ensure that sufficient information has been made available. Note: Candidates requiring only certain modules may have to attend the full training programs but only sit the modules required. CTT will if we have enough course candidates supply specific courses to suit operational needs. Existing certificate holders must have six weeks validity remaining on their current certificate from course end. Candidates are offered refresher training on our initial courses should a refresher course not be available subject to the six-week rule being applied. Note: Candidates taking the above option must be aware that the time scale will be that of initial training. 0830 – 1600, Day 1 Core Module, Legislation etc. Refresher training takes the form of initial training but with the times allocated condensed, examinations taken at the end of training. Refresher training is only available to candidates who already posses a valid certificate.